Factional fights in President Robert Mugabe’s Zanu PF are exploding amid claims from different camps that senior officials are plotting to rig provincial polls in order to strategically position their cronies. With Zanu PF going for an elective congress next year, insiders say the chaotic scenes which derailed polls in Mashonaland West and Midlands last weekend were just a tip of the iceberg as the battle to succeed Mugabe hots up. 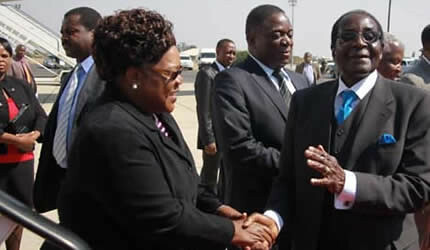 Battle lines have been drawn between vice president Joice Mujuru’s camp and the other one led by Justice and Legal Affairs minister Emmerson Mnangagwa, the two Zanu PF heavyweights tipped to succeed Mugabe once he relinquishes office. The wars to succeed Mugabe — hitherto played in Zanu PF corridors of power — have now found space in the State media which yesterday attacked the party’s secretary for administration Didymus Mutasa for jumping the gun when he suspended Munyaradzi Kereke from the party. Mutasa reportedly sympathises with the Mujuru camp and at one point publicly said it will be abnormal for Mnangagwa to succeed Mugabe saying as Zanu PF secretary for Legal Affairs, he was far down in the liberation war movement’s perking order. Fireworks are expected at the party’s Politburo meeting tomorrow. Insiders say the state media has just ignited a war that might have a nasty end. “Once the politburo sits, then that is final, Kereke was expelled by the politburo chaired by the president and thus he was expelled by the party,” said a source. The attempts to whitewash Kereke’s expulsion has been interpreted as a declaration of war by the Mujuru camp. Insiders say the ongoing polls were critical as they are likely to determine power dynamics in Zanu PF since chairpersons who will be elected to lead provincial structures will determine the party’s presidium come congress in December next year. Currently, the presidium is led by Mugabe as first secretary, Mujuru as the second secretary, Simon Khaya-Moyo as the chairperson and Didymus Mutasa as the secretary for administration. But the positions, save for that of Mugabe, are by no means guaranteed come congress, raising the stakes in the ongoing provincial elections which are seen as the start of a race to take over the leadership of Zanu PF. Monica Mutsvangwa had to withdraw from the Manicaland race against John Mvundura claiming that the provincial elections to choose a new chairperson were fraught with irregularities. Mvundura reportedly belongs to the Mujuru faction while Mutsvangwa belongs to the Mnangagwa faction. Efforts to speak with Mutsvangwa yesterday were fruitless but she was quoted in the state media demanding a rerun, citing several irregularities. “Returning officers were impartial. In all districts which I had an upper hand; they were starved of ballot papers. Remedial action should be taken. A rerun is important because we want our electoral processes to have integrity,” fumed Mutsvangwa. In Mashonaland West, Mugabe’s own backyard, a war is sizzling as the two leading factions seek to outsmart each other in the battle for control of the region. MP and former fitness trainer Temba Mliswa, is up against businessman Philip Chiyangwa and Nimrod Chiminya for the Mash West provincial chair. Mliswa belongs to the Mujuru faction. Nationwide tensions are simmering in the guerrilla war movement with indications that battle lines for a potentially bruising combat have been drawn and that factionalism was rearing its ugly head, even through the state media. State media columnist Nathaniel Manheru recently attacked the Mujuru camp and on Saturday revealed that some heavies within the party threatened him, but said he was unfazed by the threats.